Background: The association between consumption of multivitamins and breast cancer is inconsistent in epidemiologic studies. July 2010), and the Cochrane Central Register of Controlled Trials (The Cochrane Library 2010 issue 1). 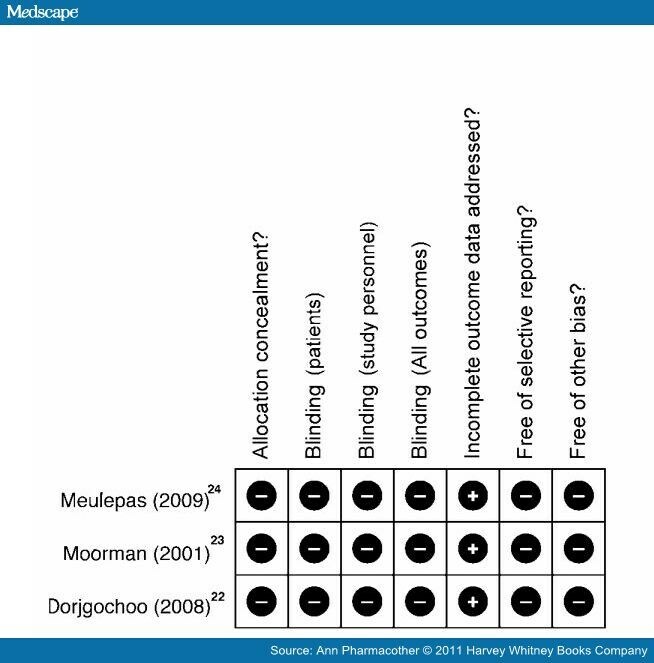 method of the Cochrane Collaboration. 1.00), respectively. The association was not statistically significant. controlled clinical trials to further examine this relationship. multivitamins with multiminerals may have an adverse impact on health. increased risk of breast cancer associated with multivitamin use. decrease in breast cancer risk associated with multivitamin use. These results are vague and confusing to clinicians and people interested in using multivitamins for preventive purposes. increased or decreased risk of breast cancer. 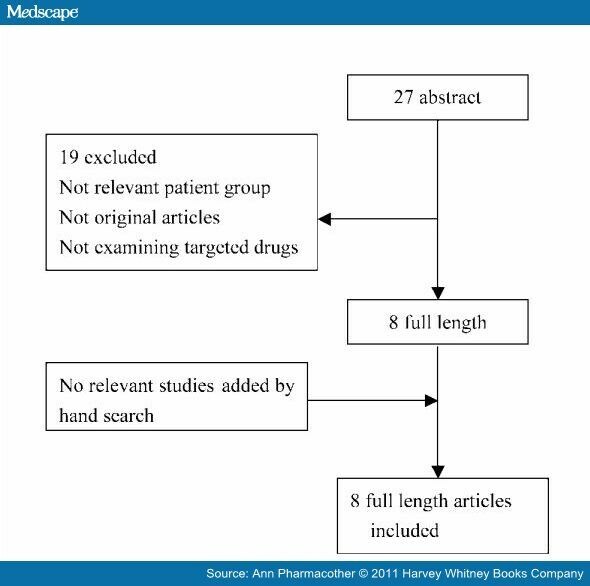 The authors manually screened the reference lists incorporated in a meta-analysis published by Larsson et al., a systematic review of the literature published by Velicer et al. in 2008, and the references in all identified studies. findings were resolved by consensus. statistic describes the percentage of variation across studies that is caused by heterogeneity rather than chance. lies between 0% and 100%. A value of 0% indicates no observed heterogeneity, and larger values show increasing heterogeneity. Cochrane Collaboration. We also analyzed the association between breast cancer risk and the frequency and duration of multivitamin intake. evidence using the GRADE approach. 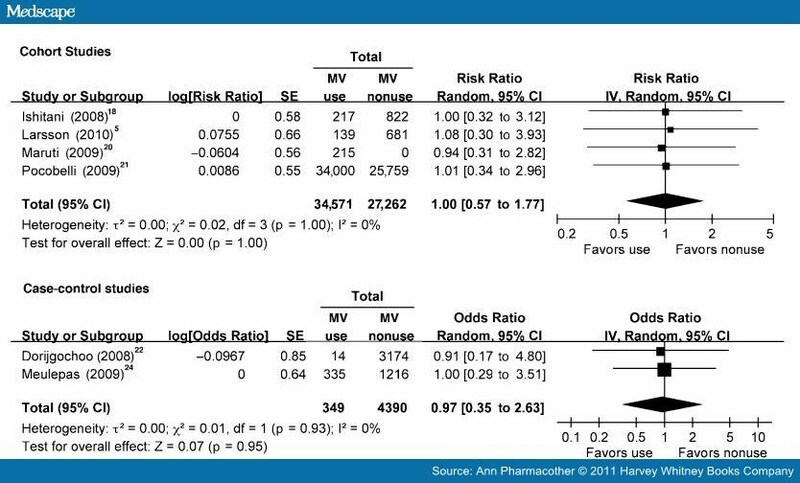 Overall risk of breast cancer with MV use vs MV nonuse in cohort studies. MV = multivitamin; NA = not available. 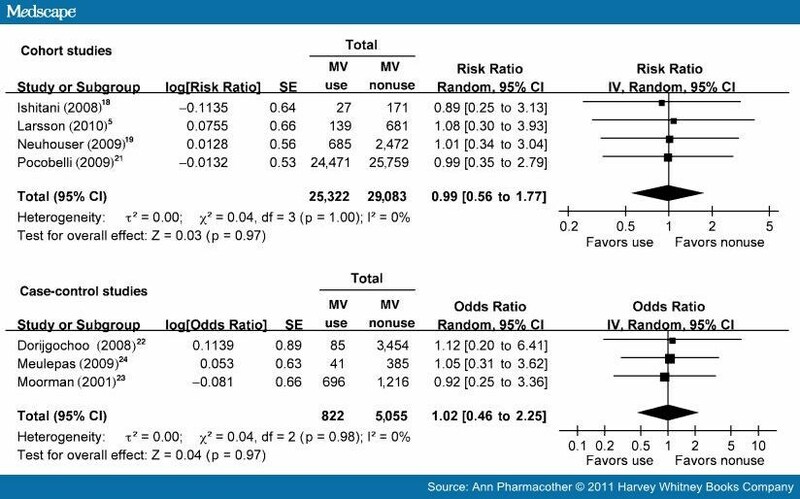 Overall risk of breast cancer with MV use vs MV nonuse in case-control studies. MV = multivitamin; NA = not available. postmenopausal hormone intake should be included in the analysis. receptors was mentioned only in 1 cohort study. respectively) (Figures 4 and 5). Overall relative risk of breast cancer in cohort studies. MV = multivitamin. 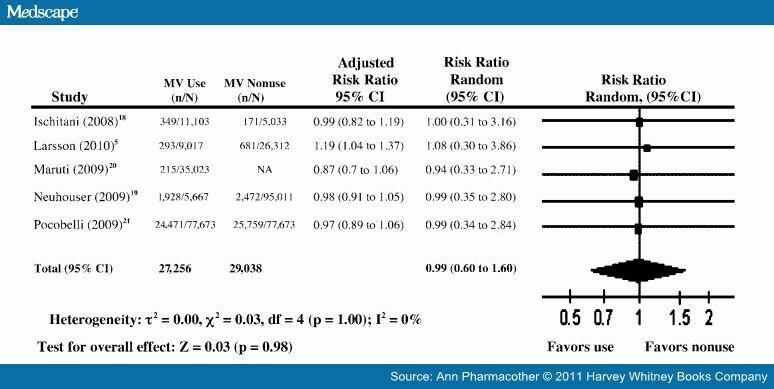 Overall odds ratios for risk of breast cancer in case-control studies. MV = multivitamin. Meta-analysis for intake duration of ≥10 years or ≥3 years. MV = multivitamin. Meta-analysis for frequency of use ≥7 times/wk. MV = multivitamin. of these studies indicated low scores using the GRADE method. Risk of bias graph for case-control studies. – = high risk of bias; + = low risk of bias. Risk of bias graph for cohort studies. – = high risk of bias; + = low risk of bias. intake and the risk of breast cancer was still not significant. years had a 22% lower risk of breast cancer. disease, and an 18% increase in death from all causes. The concern regarding the adverse effects of folic acid on recurrences and metastases has therefore been raised. patients regarding multivitamin use and risk of breast cancer. supplements and increased or decreased risk of breast cancer. Rock CL. Multivitamin-multimineral supplements: who uses them? Am J Clin Nutr 2007;85:277S–279S. Neuhouser ML, Patterson RE and Levy L. Motivations for using vitamin supplements. J Am Diet Assoc 1999;99:851–4. Larsson SC, Akesson A, Bergkvist L and Wolk A.
Swedish women. Am J Clin Nutr 2010;91:1268–72. Walde AV. Multivitamins boost DNA repair capacity. 4568. Presented April 18, 2010.
alternative medicine (CAM) usage in Singaporean adult cancer patients. Bell CM, Urbach DR, Ray JG, et al. Bias in published cost effectiveness studies: systematic review. BMJ 2006;332:699–703. Larsson SC, Giovannucci E and Wolk A. Folate and risk of breast cancer: a meta-analysis. J Natl Cancer Inst 2007;99:64–76. review. J Clin Oncol 2008;26:665–73. Higgins JP, Thompson SG, Deeks JJ and Altman DG. Measuring inconsistency in meta-analyses. BMJ 2003;327:557–60. The Cochrane Collaboration. http://www.cochrane.org (accessed 2007 Oct 20). GRADEpro: The Cochrane IMS. http://ims.cochrane.org/revman/gradepro (accessed 2007 Oct 29). the Women's Health Initiative cohorts. Arch Intern Med 2009;169:294–304. breast cancer risk. 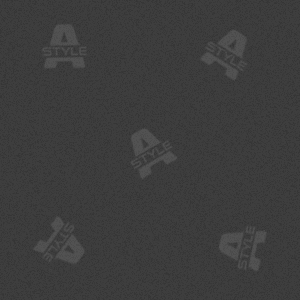 Am J Clin Nutr 2009;89:624–33. mortality. Am J Epidemiol 2009;170:472–83. Study. Breast Cancer Res Treat 2008;111:269–78. Moorman PG, Ricciuti MF, Millikan RC and Newman B.
Vitamin supplement use and breast cancer in a North Carolina population. invasive breast cancer. Public Health Nutr 2010;13(10):1540–5. risk of breast cancer. Arch Intern Med 1998;158:41–5. randomized controlled trial. JAMA 2005;294:47–55. Health Study: a randomized controlled trial. JAMA 2005;294:56–65. Health Gend Based Med 2000;9:19–27. disease in women. N Engl J Med 2005;352:1293–304. Women's Health Initiative clinical trial and observational study. supplement users. Am J Epidemiol 2004;159:83–93. cancer. Int J Cancer 2003;105:413–8. and molecular biology. Breast Cancer Res Treatment 1995;35:51–60. incidence in postmenopausal women in the Malmö Diet and Cancer cohort. Am J Clin Nutr 2007;86:434–43. Ebbing M, Bønaa KH, Nygård O, et al. Cancer incidence and mortality after treatment with folic acid and vitamin B12. JAMA 2009;302:2119–26. Ulrich CM and Potter JD. Folate and cancer—timing is everything. JAMA 2007;297:2408–9. Sackett DL. Bias in analytic research. J Chronic Dis 1979;32:51–63. GRADE Working Group. Grading quality of evidence and strength of recommendations. BMJ 2004;328:1490–7.